With this operation type, a new data record, such as a new product, will be delivered to the web service, which will be inserted in its original data records. 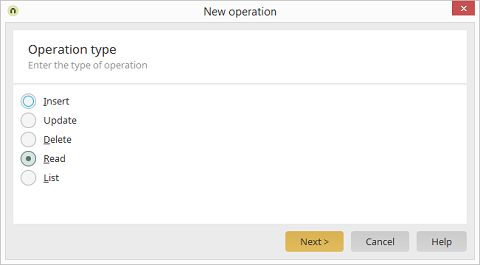 With this operation type, an existing data record in the source application will be changed. With this operation type, an existing data record will be deleted from the source application. The procedure for the definition of this operation does not differ significantly from the operation type Refresh. The data record to be deleted will also be ascertained by the ID transmitted. Additional transfer parameters, i.e. additional data fields that will be taken into account for the comparison, cannot be defined. When deleting a data record, this will not be necessary. For this operation type, the data from existing data records will only be read. The identification takes place here automatically via the ID as well. All data fields of the source application can be selected as return parameters. This operation type differentiates itself from the other types insofar that multiple data records, comparable to an array, can be read here. This operation type can be used, for example, to search for the occurrence of a specific character string in product numbers.